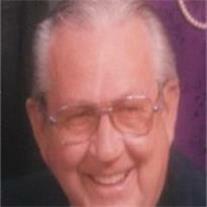 Joseph Levi Taylor passed away March 13, 2012 in Mesa, AZ. He was born March 1, 1924 to Delbert Guy and Eva Viola Clement Taylor. He was the oldest of six children. Joseph was raised in Rexburg, Idaho and attended Madison High School there. When World War II broke out, Joseph enlisted in the army and served courageously in the Pacific Theater until his honorable discharge. After his military service, Joseph served a 30 month Danish mission in Copenhagen, Denmark under Presidents Alma Petersen and Edward Sorensen. He then attended and graduated from Brigham Young University in 1951. From there, he went to Georgetown University (1955) to learn dentistry. While in Washington D. C., he met and married the love of his life, or in his own words “the best thing that ever happened to me.